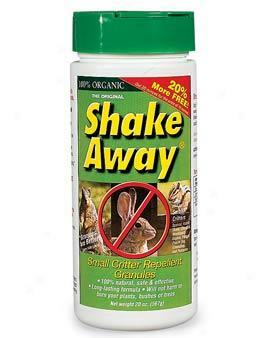 Shake-Away Small Critter Repellent Granules are a natural and humane solution for repelling small rodents. If you need an effective solution to repel rabbits or other small creatures, consider Shake-Away Small Critter Granules. Shake-Away Small Critter Repellent Granules works on critters instinctual fear of lurking predators. By applying Shake-Away you are mimicking a predators habit of marking their territory, which activates the unwanted rodent's instinctual fear and habit to flea driving rabbits and other small rodents far away from your personal space. Would you like to see the Shake-Away Small Critter Granules MSDS?